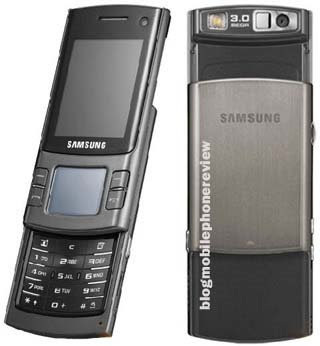 Samsung U900 reappear in the new version of the Samsung S7330. Make like the Samsung U900 output, a new type issued this time can be an alternative especially those sensitive to the price. Unfortunately, this seems the phone is a samsung U900 imitation of it as minimal. If viewed at a glance, is rather difficult to distinguish the phone from the preceding. Physical appearance of the Samsung S7330 is almost not different with the Samsung U900. Some of the features inside are relatively similar except for some features of the reduction. Yes, the phone can be called a junior this as a generic version of the Samsung U900. Samsung S7330 use concept with slim elegant look Samsung U900. The vendors seem reluctant to touch U900 took time to develop cheaper versions of this. The design, what is offered can give spirit in the Samsung S7330. This is not much difference found in the full touch navigation key alias sensitive touch sensor called a "magical DaCP by Touch". In the panel that seems to be this secondary screen, various icons may appear attractive according to the function when the phone is used. When navigating, the arrow keys in the four corners and a bookmark will appear as an OK guide. Unfortunately, although quite intuitive, but often slip the finger touch the area does not have clear limits. Apart from that, the presence of the touch pad is a herb that is quite effective to strengthen the value of selling Samsung S7330. Moreover, touch sensor on the phone can be arranged sensitive level. For those who will not be less comfortable using the Soft key button combined with the usual touch panel. Keypad for relatively the same as the Samsung mobile phones in general. Meanwhile, on the back of the plain in the default position, slide the new panel is opened when the camera appears. But making little difference. At the interface, in the main menu which is used exactly as the property of Samsung U900. Be calculated with a comfortable and dynamic layout and icons of color composition combines good. Uniquely, the display theme can be created through private "create a theme." Samsung S7330 has decreased the quality of the camera. If adopted U900 Samsung 5 megapixel camera, this phone offers only the main camera with 3 megapixel capability. Facilities offered are not as excited U900. In the experiment conducted photographs, Samsung S7330 takes a little bit long in the process, so that sometimes affect the stability picture. In addition flash can not be optimal in the minimal room light. Results indoor and outdoor images relatively good size for 3 megapixel camera. To take a video, the phone only uses quality video recording with QCIF resolution (176 x 144). Compare with other phones that are more optimal in this feature. Video format is mp4. Not abandoned the music business Samsung S7330, which features a variety of support activities, entertainment is available through the ear with the full. Just like other mobile phone the ability to play music and video available. For the song, the file format is supported, among other MP3/AAC/eAAC + / WMA. Quality of sound radiated from a mobile phone that shows that this position is not included in the musical category handset. The output from the loudspeaker and a less vigorous. But the sound quality still awake and clear. Samsung S7330 also features pin another form of entertainment FM Radio. To enjoy them, you must use the handset that are included in packet sales. As a complement of features RDS (Radio Data System) is also included. Unfortunately the sound out of the headset is less optimal. To support the connection, the origin Korean vendor Samsung S7330 is complete with a USB data cable version 2.0 and version 2.0 Bluetooth profile that supports the Advanced Audio Distribution Profile (A2DP). To access the virtual world, this phone is support GPRS and 3G. However, to reduce the ability of Samsung HSDPA phone. Unlike U900 is supported speed 7.2 Mbps, Samsung S7330 can only surf the internet with the optimal speed of 3.2 Mbps. Samsung S7330 implement Java MIDP 2.0 platform, but difficult to install because you have to download the application from the internet. Affairs for the memory, this mobile phone only has internal storage capacity of 35 MB (shared). Relatively small, fortunately already have a micro SD card slot support. In the case suplay power, the battery must be owned by Samsung S7330 is quite extravagant. Ante capacity 880 mAh battery of the phone has not been sufficient to support the features that have, especially for internet and music. Once in the rechargeable, battery Samsung S7330 can only stand 2 days. The price on the Samsung S7330 is a matter that is quite sensitive. In the market many products that using official specification is equivalent to the more formidable. But can not be avoided if the exterior style of the Samsung Soul S7330 actually has a strong position that can raise the value of selling in the consumer's eyes. Unfortunately, there is no phone in the new Samsung S7330 rather U900, in addition to price reduction because of the quality and feature.